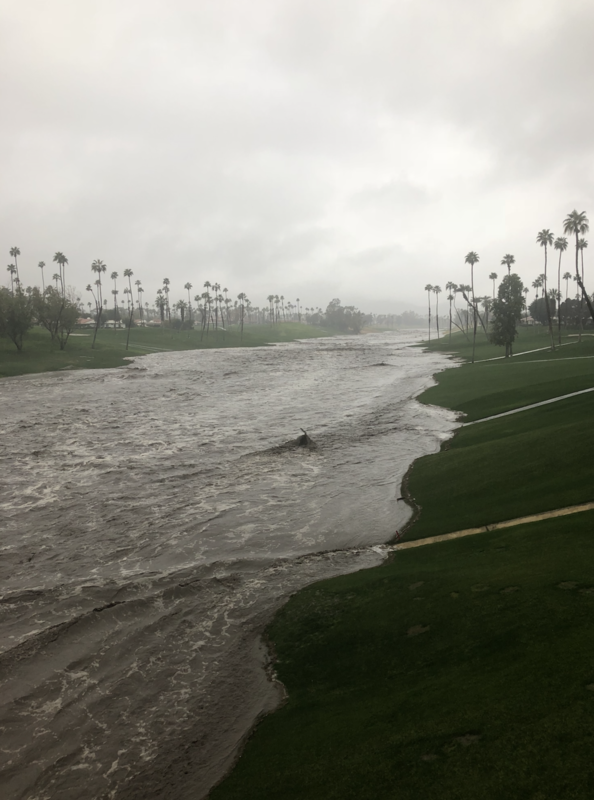 As cleanup from the recent devastating storm continues to commence, a new storm system is taking aim on the Palm Springs area tonight and Thursday. This storm is not expected to create extreme rainfall amounts, but it will be memorable in that it may be the coldest storm of the season thus far. We will likely see a slow warm up into next week (although that is somewhat questionable), with more storms possible on the horizon after March 1st. More on that shortly. As of late Wednesday afternoon, the next storm is seen developing over Southern Oregon (source: NOAA). It is expected to move south to over Southern Nevada by Thursday afternoon. Highways in red could potentially experience snowfall late tonight through Thursday night. Highway 74 and 243 in the Garner Valley and Idyllwild area are most likely to see heavy snowfall. Highway 62 through the Yucca Valley area is also likely to see a dusting, with perhaps a few inches likely. Even I-10 near Banning and Yucaipa could possibly see a light dusting. If the snow level drops slightly more than expected, it’s possible more snow could fall. Be prepared for major travel disruption if this occurs. Further away, I-15 south and north of Las Vegas is expected to receive at least 1-2 inches of snow, perhaps even more, sometime between Thursday morning and Friday morning. This could greatly impact travel along the interstate. Also, I-40 from near Kingman to Flagstaff is expecting 6-8 inches near Kingman, and over a foot near Flagstaff. Here is the latest predictions for precipitation amounts in various areas. Keep in mind, these are estimates. Due to the convective nature of this storm, some areas will likely receive lesser amounts, and others may see higher totals. Best thing to remember for this storm is that snow may fall in areas it doesn’t fall very often. A scattered thunderstorm could also briefly allow hail or graupel to fall at lower elevations, mostly Thursday afternoon and evening. Intense, widespread flooding rains are not expected, even if a scattered storm creates brief heavy rainfall in a specific area. BRIEF WARMING POSSIBLE NEXT WEEK? Yes! For those that want to shed a few layers, we may actually approach or even exceed 70 degrees next week! However, the computer models are all over the place about just how warm it may get, so it’s unclear if 68 is the highest we get, or if we may be graced with high temps in the mid 70s. I’m certainly ready for some 70s again! STORMS LURK ON THE HORIZON THOUGH…. Long range computer models show a shift in the weather pattern sometime close to or after March 1. Instead of storms diving down from the north and northwest, like what is expected tomorrow, the storm track is showing indications of becoming more zonal, allowing a more west to east trajectory. This type of pattern usually allows snow levels to be somewhere around 6,000 feet. It also will allow storms to pick up greater moisture from the subtropics, allowing for heavier rainfall totals. Some indications show California could be hit by several more “atmospheric river” events like the one that brought heavy rain several days ago. It is too early to predict exactly what will come of this next weather change, but it is HIGHLY SUGGESTED to be sure you take advantage of the fine weather this upcoming weekend to clear out any drains and yards that need them after the recent storms. Rainfall since October 1 (start of annual season): 7.21 inches (normal is 3.50). We are 3.71 inches above normal. Rainfall for February: 4.25 inches (normal is 0.65 inches). We are 3.60 above normal for the month. Normal high and low: 73/49. Yesterday, the high/low was 60/39. It isn’t likely Palm Springs will see any snowfall the next 2 days, but the nearby mountains will get another impressive dump! Enjoy the sights, and use caution if you are traveling in the snow! The well advertised “atmospheric river” took aim at Southern California last night and today, bringing in high levels of moisture from the subtropics. A low pressure system paired up with this moisture, and the combination has brought excessive amounts of rainfall to most areas of the state today. Flooding has been reported in many areas, with dangerous traveling conditions. Thankfully, the moisture plume is advancing east, and will be leaving our area within the next few hours. Skies may become partly cloudy before sunset, with most of the heavy rain likely ending. A few scattered light showers are possible tonight and Friday (and again Sunday), but those should mostly be confined to the nearby mountains and also in the higher desert areas near Pioneertown, Morongo Valley, Yucca Valley and Joshua Tree. Widespread torrential rains are NOT expected tonight or tomorrow. HOWEVER, in the meantime, it may take several days or more for many of the flooded washes to dry up. It will also take awhile for roads to be cleared. More on road closures in a moment. A plume of very moist air from northeast of Hawaii combined with a potent low pressure system, which took aim directly at Southern California today. A very strong storm earlier in the week struck the Hawaiian Islands with destructive winds, high surf and even snow down below 7,000 feet. This was a rarity for Hawaii. This storm tapped into moist air from the tropics, and the air circulation patterns around the low pressure system carried the moist air to the northeast. The “perfect setup” occurred, as this moisture combined with a low pressure system moving southeast off the coast of California. This formed a relatively narrow “river” of moist air that hit Southern California, mostly between about Big Bear on the north, and San Diego on the south. Since the air mass associated with this system originated far to our south, the snow level rose all the way up over 10,000 feet today. This meant all the precipitation fell as rain, even up most of the nearby mountain slopes. The already heavy rainfall fell atop a heavy snow pack, and added to the extreme amount of water flowing off the nearby mountains. Mt. San Jacinto has already reported over 9 inches of rain since last night, which is why the rivers flowing off the mountain are nearly overflowing. Rainfall totals in the Palm Springs area have averaged 2-4 inches, with 1-2 inches in the Yucca Valley and Joshua Tree area, and around 1 inch in the east valley areas. Here’s a map from the National Weather Service, as of about 1 pm. These numbers will likely rise a bit as the rain is still falling in some areas. Clearly, today’s deluge hit the mountains hardest, with most areas picking up 5-9 inches overnight. Whitewater River in Palm Desert at Monterey Rd. The Araby Wash at highway 111, nearly rising up to the top of the ledges. Highway 243 near Lake Fulmor, in the Idyllwild area, has been washed out. Several weaker weather systems are expected to pass through Southern California the next 5 days. The next appears late Friday and Friday night, then again Sunday. Both systems are not expected to be major rainfall producers for the deserts. However, they may drop light rain at times, and may increase the winds as well. Temperatures will be chilly over the weekend, and lowering snow levels will make snowfall likely once again in the mountains. Lowering temperatures will likely lead to icing of leftover water above about 4,000 - 5,000 feet, adding to cleanup challenges in the Idyllwild and Big Bear areas. Stay safe out there, and stay tuned to additional road closures. I’m sure the brave people employed to clear our roads will be doing their best to help return travel patterns to normal over the course of the next 7 days! They will have their hands full! The cold front is moving east into the Los Angeles area currently. A squall line has set up, with a band of extremely heavy rain and wind gusts approaching 50 mph. Ahead of this line of stormy weather, the wind is blowing from the southeast. Rainfall rates within the narrow squall line have been as high as 0.50 inch in 10 minutes time, indicating blinding rainfall. Fortunately, the squall line is rather narrow, and rainfall rates quickly are diminishing to heavy, but not torrential levels, once the band moves east. The winds quickly switch to the southwest behind the squall line. Notice the narrow, wavy dark green band indicating the “squall line” as of 11:15 am. A closer look at the wind observations shows this squall line is the intersection of the wind shift from the southeast to the southwest. Wind gusts are noted in red. This cold front is moving east into LA, San Diego, the Inland Empire, and the San Diego areas. Those areas will experience increasingly heavy rainfall and increasing winds. As the squall line passes through, it will provide a short period of perhaps 10-20 minutes where rainfall rates will become extreme, with low visibility and suddenly increasing winds to over 40-50 mph. As the squall moves east, rainfall rates will likely diminish somewhat, and winds will shift and slowly diminish about a half hour later. Estimated progression of the wind shift and squall line to the east the remainder of the afternoon. Based on the current forward speed, this wind shift should hit the deserts somewhere close to 3:00 - 4:00pm this afternoon. Due to the terrain, it will not likely be as dramatic as what is being experienced in the coastal areas. Flash flooding has been reported in many areas of Santa Barbara, Ventura and LA Counties. However, it is likely that rainfall rates will increase in the deserts between 2:30-4:30pm. Also, when winds shift to the southwest, it is possible that some sections of the Coachella Valley will become very windy for a few hours. Thus far, the Coachella Valley has had winds mostly under 10 mph. Some southeast winds approaching 25 mph have been blowing in the far east valley near the Thermal and Coachella area. In the Yucca Valley, Landers and Joshua Tree area, winds have been stronger, as was expected. As of just before 12 noon, here’s a map of the wind gusts (in red, below) for those areas. Notice that the Burns Canyon site on the north slopes of the San Bernardino Mountains has a current gust to 63 mph. Gusts there have been between 60-80 mph most of the morning. A bit lower in elevation, the Landers and Yucca Valley area have begun to see winds increase into the 40-50 mph, as have higher peaks within Joshua Tree National Park. As the cold front approaches, it is likely these areas will continue to see widespread high winds the remainder of the afternoon as well. Current wind gusts (in red) as of about 11:45 am. As the cold front moves into our area, it is largely expected that nuisance flooding of roads and intersections is likely. As the rains continue into the night, most of the area washes are expected to begin swelling with water, with many of the usual wash crossings running the risk of closure due to high water flows. POSSIBLE ROAD CLOSURES for tonight and Sunday are noted in RED below, including Indian Canyon south of I-10, Gene Autry Trail south of I-10, and Vista Chino east of Gene Autry Trail, as they cross the Whitewater Wash. In addition, Golf Club Drive north of highway 111 and Cathedral Canyon Rd north of Perez Road can sometimes experience water across the roadway in the Cathedral City area where the roads cross the Whitewater River. Also, Dinah Shore can experience some short term flooding west of Cathedral Canyon Rd during a heavy rain event. The areas outlined in RED (below) indicate the areas to be on the lookout for water and potential flooding or road closures the next few days. Additional rainfall is likely Sunday through Tuesday, although rainfall amounts in the deserts are not anticipated to be as significant. Mountain areas will see snowfall pile up the next several days, especially in the Big Bear area, as indicated in the previous reports. Anyone traveling to the High Sierra should consider postponing their travels as well. Mammoth is expected to receive 5 feet of snow in town the next few days, with 10 feet up on the ski summits. Lake Tahoe is also expected to receive 2-4 feet in town and 5-8 feet up on the slopes. This will make travel impossible at times along I-80 and US-395 in various locations the next several days. Enjoy the rains, and watch for any weather warnings via the National Weather Service the next several days. The next in a series of storms is forming off the coast of California, ready to move onshore over the weekend. This storm is larger than many we’ve seen this winter, and has significant pressure gradients in place to produce potentially damaging wind gusts to many areas of California on Saturday. Here’s an image of the enormous storm forming off the coast of California as of 11am Friday (image courtesy of NOAA). However, as is always the case, forecasting exactly which areas of the Coachella Valley will experience winds with this next system is going to be difficult. We definitely will experience rain however, so that portion of the forecast is less in doubt. At this time, after examining the various weather models, it appears the best chance for damaging winds will be in the mountains, and the north slopes of the San Bernardino Mountains. South winds could exceed 80 mph in some of those areas. Highway 18 from Big Bear to Lucerne Valley could be particularly vulnerable to damaging winds. Pioneertown and North Landers may also see extreme gusts. These winds are likely to be strongest from about 9 am - 4 pm Saturday. Slightly weaker, but still strong winds up to 40-50 mph or more are likely in the remainder of the high desert areas, including Yucca Valley, Joshua Tree, 29 Palms, Victorville, Apple Valley, and the Barstow area. Winds for the Coachella Valley are a bit more difficult to predict. Winds for most of Saturday are expected to blow from the south and southeast. This is usually an unfavorable direction for high winds in the Coachella Valley, as the topography of the nearby mountains typically blocks most of the wind from surfacing. However, due to the incredible dynamics associated with this incoming storm system, it is certainly possible high winds will occur at times Saturday afternoon, especially along the southern foothills, including South Palm Desert, South Rancho Mirage near highway 111, Cathedral City Cove, as well as the Araby and Indian Canyons area of South Palm Springs. As the powerful cold front approaches late Saturday afternoon, winds are expected to shift to the southwest and west. During this time period, which is currently expected between about 2 pm and 7 pm Saturday, would be the most likely period of severe winds in the Coachella Valley, if they occur. Winds may also begin to crank through the I-10 corridor as well, where we may have northwest winds blowing along I-10, into the northern areas of town…. and we concurrently have southwest winds blowing along the southern areas along the 111 corridor from Palm Springs to Palm Desert. It’s a tough wind forecast, but the takeaway is that winds in some areas will be strong, whereas other area may be protected. My best advice is to prepare your yards for the worst, but don’t be surprised if the wind doesn’t blow much in any one spot. As a sidenote, high winds are expected in the coastal and valley areas of the rest of Southern California. Anyone traveling into San Diego, Orange County, the Riverside area, Los Angeles, Ventura, Santa Barbara and up into the rest of Central California should be prepared for the possibility of high winds, downed trees and power outages Saturday afternoon in those areas most exposed to high winds from the south. I-5 over the Grapevine and US 101 will be particularly at risk. Heavy amounts of rain will fall in many areas of California, with heavy snow in the mountains. Flash floods and mudslides are likely in many areas, especially the burn areas from the last several years. Malibu, the mountains of Orange County, and the Santa Barbara area need to be prepared for possible damage. The Coachella Valley will have varying amounts of rain, mostly between 0.40 - 1.25 inch for Saturday and Saturday night. 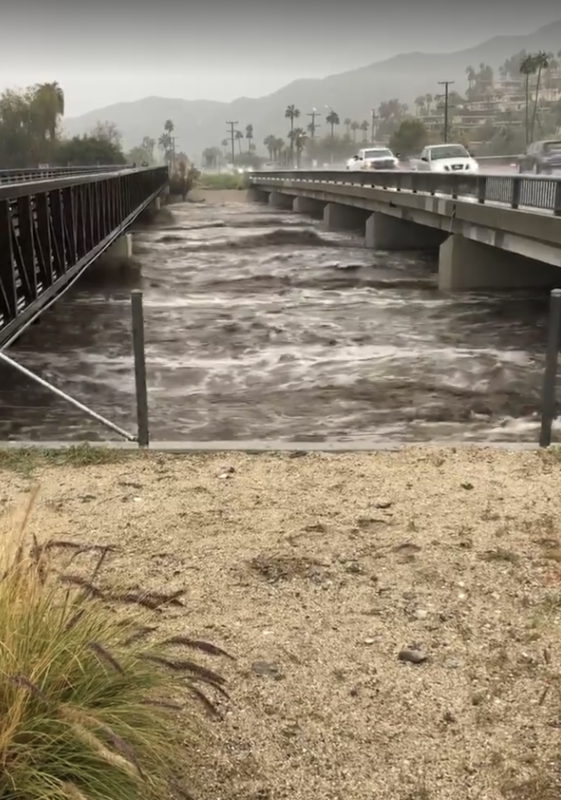 This will likely be enough to get the washes running for a day or two, so it is possible that Indian Canyon and Gene Autry Trail may be closed for awhile at the wash. Some water could fill the Araby wash as well by late Saturday or Sunday, and the Tahquitz Creek will likely see renewed flow increases. The nearby mountains will see varying amounts of snow. For elevations above 8,000 feet, 1-3 feet of snow is possible this weekend. Lesser amounts will fall between 7,000 - 8,000 feet, with several inches possible from 5,000 - 7,000 feet. Weaker systems are expected to come ashore Sunday, Monday, and again Tuesday evening… which is likely to drop several more inches of snow on top of that which falls Saturday and Saturday night with the main storm. However, the unsettled weather Monday - Wednesday is likely to hover over or west of the mountains, but the deserts will likely remain partly cloudy and cool, with only a slight chance of scattered showers predicted for Monday - Wednesday. The extended forecast currently shows dry and slightly warmer weather returning for Wednesday - Friday, with highs likely staying in the 60’s. Some breezy north winds are possible at times. The long term models are hinting at the dry weather continuing next weekend, before possibly turning unsettled yet again sometime after February 6-8th, for yet another period of wet weather for the state by the middle of the month a distinct possibility. Wind Advisory for the Coachella Valley, Yucca Valley and 29 Palms areas for Saturday: winds may gust to 45-50 mph as the cold front passes through, especially between 2-6 pm. Some areas may not experience high winds that are sheltered by nearby mountains, however. High Wind Warning for the mountains, and the high deserts for Saturday: winds may gust to 80 mph in the higher mountains and also on the north slopes of the San Bernardino Mountains, including Apple Valley, Lucerne Valley and the Victor Valley. Winter Storm Warning for the mountains: Up to 2 feet of snow above 8,000 feet, and 4-12 inches between 6,000 - 8,000 feet between late Saturday afternoon and Sunday afternoon. Snow level will drop from 7,500 Saturday to 4,500 feet by Sunday. Additional snow may fall Monday through Wednesday morning. Flash Flood Watch for the lower elevations of the mountains, and the coastal areas of Southern California from Orange County to Santa Barbara, including LA, OC and the Inland Empire. Intense rainfall rates may cause flash flooding on Saturday and Saturday night. Up to 7 inches of rain could fall on the coastal slopes of the San Bernardino Mountains on Saturday and Sunday. Drought easing will continue. Most of California is at or close to normal or even above normal rainfall and snowfall for this date. The additional storms the next 3-4 days will likely create totals in many areas that will be 125% - 150% of normal, or more. Good news for water concerns! Friday afternoon graphic from the National Weather Service, showing which areas are covered in watches and warnings. The brown color indicates Wind Advisories, the dark green indicates Flash Flood Watches, the pink indicates Winter Storm Warnings, and the mustard indicates High Wind Warnings. Enjoy the next round of wet weather! Winter doesn’t often last for long here in the desert, so now is your chance to enjoy the dampness while it lasts! Sunday afternoon is proving to be cloudy and cooler, as forecasts were calling for. Scattered storms have begun popping up in a few areas, and a large shield of rain is lurking south of the Mexican border. Temps have mostly stayed UNDER 100 degrees today, and in some areas, temperatures are already dropping down under 90 degrees. The leading edge of the cloud shield associated with weakening Hurricane Rosa has now spread over most of Southern California. Cumulus clouds have been popping up in the increasingly unstable and humid airmass as well, and winds have backed to the southeast and east. As of 430pm, strong thunderstorms had formed along the Colorado River Valley from near Yuma up to the Blythe area. Some areas near Blythe have received well over 0.50 inch of rain thus far, and several downdrafts associated with these storms have created dust storms that are currently moving west through the Imperial Valley, as well as west along I-10 near Desert Center. As of 430p, a few thunderstorms formed from near La Quinta and were moving northeast into the Indio area. Also, a larger area of thunderstorms has been forming and re-forming in an area east of the Salton Sea, towards Blythe. Outflows associated with the thunderstorms have created a dust storm, as indicated by the red dotted line above, moving west. If the outflows continue marching west, it is possible the skies will become hazy or dusty in the Coachella Valley, sometime in the 530 - 630pm time frame. East winds may increase to the 20-30 mph range for a brief period, if this outflow holds together. Currently, visibility has dropped to less than 0.50 mile in portions of the Imperial Valley near Imperial. Yuma and Blythe had reduced visibility earlier today as well. The next areas to possibly receive dust could be the Salton Sea, as well as the Thermal and Coachella area. More likely than not, this outflow will likely weaken before reaching Palm Springs. As previously mentioned, as of 430pm, there is a stationary area of thunderstorms in a line from just south of La Quinta, and to the northeast into Indio. The area of storms continues to reform in the same location, and may begin street flooding soon, if the storms don’t begin moving along. They are forming along the leading edge of the cloud shield of the distant hurricane. After sunset, most of the thunderstorms are expected to begin diminishing, leaving a chance of light to moderate showers at times tonight. Rainfall is likely to be under 0.10 inch. Monday and Monday night is expected to experience more steady rainfall, likely 0.25 - 0.75 inches throughout most of the Coachella Valley. It is possible there may be localized greater amounts, but flooding rains are now expected to be focused more to our east, in Western Arizona. Still, this could bring us a nice soaking. Several additional storms will move in off the Pacific on Tuesday - Thursday. These storms will mostly focus rain and thunderstorms from the mountains to the coast, with the deserts not likely to receive large precipitation amounts. However, a few showers could make it over the crests and across our deserts. Enjoy the upcoming cooler weather, as temps will likely drop into the 80s much of the week… with low down into the 60s soon! STORMY WEATHER POSSIBLE - MAJOR CHANGE ON ITS WAY! After a relatively stagnant hot pattern throughout much of September, we are going to experience a major weather shift the next 5-7 days. WHAT IS RESPONSIBLE FOR THIS IMPENDING STORMY WEATHER? A complex weather pattern is setting up. Several factors are coming together that are typically very difficult to forecast with precision. First, a cold low pressure system, one of the first of the fall season, is expected to strengthen off the coast of California, and move slowly to the southeast toward our area. This system will contain some dynamics and unstable air. Second, powerful hurricane Rosa is located southwest of Baja California. This system is expected to start moving north toward northern Baja over the weekend. As the colder low pressure system moves closer to California, the circulation around this system will absorb hurricane Rosa into its wind patterns, allowing the hurricane to be directed toward northern Baja. The incredibly moist tropical airmass will move north into Southern California, Southern Nevada, and much of Arizona starting Sunday afternoon and continuing into Monday. This will likely bring higher humidity (sorry, but not for long!) and some gusty southeast winds and haze to the Coachella Valley. The hurricane will lose much of its strength as it approaches Baja south of Ensenada. However, it may still produce winds of 45 mph and be a significant Tropical Storm. It’s relatively rare for a landfalling tropical system this close to our area. The second phase of the storm is expected on Tuesday, possibly a little longer. The low pressure system off the coast will move over our area, bringing scattered showers and thunderstorms. Rainfall amounts will likely be highly variable, with the potential for locally heavy rains in some areas, and dry weather in others. I would caution anyone from getting hung up on the exact details at this point, since a lot of uncertainty still exists. However, there is a good chance that some areas of the deserts and nearby mountains could see 0.5 - 1 inch of rain, with scattered amounts of 1 - 3 inches or more. It is possible the heavy thunderstorms could dump even more than that in localized areas, if they occur. Some areas may see much less rain. It’s possible some areas will see nothing. However, it is important that people remain cautious between late Sunday and Tuesday, for the possibility of flash flooding, localized heavy rain and storms. It appears the heaviest rain is likely over Arizona, so anyone traveling to the east Sunday - Tuesday should be alert for any weather warnings or flash flood warnings. This weather setup has the potential to cause significant problems. Any recent burn areas, like those near Idyllwild, or in the burn areas Orange County, should be alert to the potential for flash floods and mudslides if heavy rain develops. This system is expected to finally break our hot weather pattern, with high temperatures falling into the 80s and 90s next week. Overnight lows are likely to drop Ito the 60s several days as well. I can’t speak for anyone else, but I am done with the nagging heat this season. Bring on the cooler weather! If you see someone doing cartwheels next week, it could be me. I’m not sure I can contain my excitement for the drop of temperatures! Once the tropical portion of the system moves east, it will be replaced by a cooler airmass off the Pacific, that appears to stick around for much of next week. Temperatures will gradually climb back into the 90s later next week… but the relief from the 100+ degree days will undoubtedly bring many of us out of hibernation! Let’s hope we escape any damaging floods, but get some beneficial rains this week! Incidentally, anyone traveling to the high Sierras should be aware they may experience their first significant snowfall of the season as well. Change is near! The well advertised cool down has been less dramatic than hoped, but the reduction in humidity has helped make things feel a bit more tolerable the past few days. In fact, nighttime temperatures have FINALLY dropped below 80 degrees the last several nights. Forecasts last week were calling for temps to be about 3-5 degrees lower than where they have ended up, so August is looking to still hold out to be another impressively hot month, nearly record breaking. Tuesday may be the coolest day, before slowly inching upward again the remainder of the week. As of yesterday, the average temp for August 2018, when you average both the high AND low temp, is 96.9 degrees, which is still 4.9 degrees above normal. Stronger low pressure to our north will allow the onshore flow from the coast to the deserts to continue strong early tonight, with west and northwest gusts to around 50mph possible through the I-10 corridor from Whitewater to the north Palm Desert and Indio area. Southwest winds up to 35 mph have also been blowing in the Desert Hot Springs area, up through exposed areas through south Yucca Valley and Joshua Tree. A few areas of blowing dust and sand are possible. The wind will likely creep south into a few of the more populated areas of north Palm Springs, north Cathedral City, north Rancho Mirage and north Palm Desert for a few hours this evening... but should begin to calm down later tonight. Gusty winds may occur again during the afternoon and evening hours the remainder of this week, but at lesser speeds than those expected tonight. Southwest flow of air at the upper levels has returned a drier airmass to our area. The remainder of the week is expected to be dry with periods of gusty winds. Temps may slowly creep upwards toward Friday, and humidity will remain low, with dew points remaining mostly in the 30's, 40's and 50's. Elevated fire danger due to low humidity and periods of higher winds. Temps in the Yucca and Joshua Tree area will be in the low-mid 90's this week, with nighttime temps down into the 60's. POSSIBLE COOLING AND WINDY WEATHER THIS WEEKEND? The forecast for this weekend is a bit more uncertain. Some computer models are calling for a relatively strong trough of low pressure to move into the West on Saturday, bringing a fall-like weather change. Several other computer models aren't predicting such a dramatic change, with only a slight cool down. For now, most forecasts are calling for slightly cooler weather Saturday and Sunday, with high winds possible again along the I-10 corridor. HOWEVER, if the low pressure system does in fact move south and east, it is quite likely that temps may drop to below 105 once again, and could even fall below 100 degrees, depending on how this system comes together. Strong winds may exceed 50mph along the I-10 corridor as well. Areas of the Sierras in Northern California could see nighttime temps fall well below freezing under such a scenario. Stay tuned as the forecast may change and become cooler for next weekend, depending on how things play out. In the meantime, enjoy the welcomed break from the humidity! HUMIDITY RETURNS TUESDAY... THEN, COOLER?? Yes, it may very well be true! A slightly cooler and drier weather pattern may FINALLY be on its way for a week or so, but not before one more round of humidity tracks into our area from the southeast on Tuesday. The Palm Springs area will be on the extreme western edge of another southeast push of humidity creeping north from Mexico. Southeast winds are expected to bring elevated humidity levels tonight and Tuesday, with dew points rising back up to or over 70 degrees once again. Cloudiness may accompany the wind shift tonight and Tuesday, with even a very slight chance of a shower or thunderstorm tonight and tomorrow. Hazy skies are likely as well, and even a remote chance of a nighttime haboob if any thunderstorm complexes were to form tonight in the deserts near Yuma, Arizona. The Joshua Tree area has a higher chance of a thunderstorm tomorrow, as has been the case with recent monsoon flow events. The higher terrain helps initiate greater instability and cloud formation I'm that area. The last bout of humidity and storms brought some much needed rain to the nearby mountains and deserts, as well as some incredible cloud formations and lightning shows. Mammatus cloud formations from several days ago, south of Rancho Mirage. Evening thunderstorms created a light show as lightning lit up the skies. The storm was over and south of the Santa Rosa Mountains, creating over 2 inches of rain in remote sections of the nearby deserts. Thunderstorms over the Big Bear area dropped more than 2 inches of rain as well recently. HOW HOT HAS AUGUST BEEN? The silver lining, if there is one, is that there has only been 1 night at or above 90 degrees... which is far better than July. By Wednesday, we expect the upper level air flow to switch from a southeasterly to a southwesterly direction. This tends to be a much drier pattern for our area. The lower level humidity levels will likely begin to diminish slowly starting Wednesday, and continuing though this weekend and into next week. This means dew points will likely drop once again into the 40's and 50's instead of the 60's and 70's... so evaporative coolers may in fact work again for those who appreciate the energy savings! Gusty northwest winds will become common again in the afternoon and evening hours along the I-10 corridor, occasionally lurching south for a few hours into the northern sections of the Coachella Valley communities over the next 7 days. Joshua Tree and Yucca will experience periods of gusty southwest winds as well, with a reduction of 5-8 degrees in temperatures over recent values as well. I can't speak for everyone, but I am ready for the humidity to depart for a bit. It's likely we will get a few more monsoon patterns the first few weeks of September... but climatologically they become more rare after Sept. 15th! Have a great week! Enjoy the shortening days, as we lose several minutes a day of daylight right now as we head into fall. Another surge of extremely humid air from the southeast created sultry conditions today in the Coachella Valley. Dewpoints surged up to between 75 and 80 degrees this morning, which is commensurate with conditions sometimes experienced in Florida. Moist southeast flow banking up against our nearby mountains caused the air to rise and condense, forming a layer of grey low clouds and even patchy drizzle in the valley between about 6-9 am. The satellite imagery this morning showed these localized clouds, with the mountains forming a barrier to the clouds, trapping them between the San Jacinto Mountains and the Little San Bernardino Mountains in Joshua Tree National Park. I've outlined the cloud cover that matches the topography of the nearby mountains surrounding the Coachella Valley (dotted black line). Also, the large Holy Fire in Orange County can be seen (outlined in red). The smoke this morning was blowing north into the Inland Empire, and up and over the Cajon Pass into the Victorville area. For later tonight, all eyes will be to the east and southeast of us. Currently, large thunderstorm complexes are forming along the Mogollon Rim of Arizona, northeast of Phoenix... as well as over Sonora, Mexico. If these storms hold together and move west across the Arizona deserts, there is a renewed chance of outflows and even another haboob pushing into Western Arizona later tonight. If these storms continue, they could move into our area later tonight, likely after 11pm and into the early morning hours. It is a relatively remote chance, perhaps 10% or so, but it's worth mentioning that we could be awakened by a thunderstorm or a potential dust storm under such an unpredictable weather pattern. Late afternoon satellite showed thunderstorms exploding over Arizona and Northwest Mexico. As mentioned in earlier posts, we will be vulnerable to any activity to our east for the next 2 days or so. Then, we expect a few days of drier weather over the weekend before another surge of humidity returns next week. Many of you may have taken a step outside this morning, only to notice that the humidity was sky high again. So what happened? We had a classic "GULF SURGE" event this morning, whose humidity originates from decaying thunderstorms and a shallow humid airmass from the Gulf of California. Let me explain below. Late last night, a huge thunderstorm complex formed south of Arizona. This is a common place for storms to form this time of year, as very humid air clashes with instability formed by the mountains to provide the perfect breeding grounds for thunderstorms. A light easterly flow allows these thunderstorms to drift west off the mountains into the lower deserts of Western Sonora. They encounter hot temperatures and a shallow moist layer of humid air generated from the Gulf of California, and as they move west toward the gulf, they generally begin to lose their strength for a number of reasons, including the flatter topography the further west the storms navigate, which reduces instability. As the thunderstorms collapse, strong downdrafts accompany the decay of the storms. The damp air is heavier than the warmer drier air, so density helps accelerate the moist air outward away from the decaying storms. The result is a gust of wind that accelerates far out in front of the original storm system... much like what causes our famous "haboobs." Last night, this shallow gust moved northwest from the Gulf, and continued up into the Imperial and Coachella Valleys. It was carrying the hot humid airmass from the northern Gulf of California... which has water temperatures up over 90 degrees this time of year. That extremely humid airmass easily moves along the mostly flat terrain from near the mouth of the Colorado River, all the way up into our area. The humidity increased from 26% to 57% in one hour. For those that track by the more accurate "dew point" temperature, the dew point went from 50 degrees up to 72 degrees in one hour. I took a look at communities to our south, and discovered the northwest movement of this humid airmass from late last night. It moved north of the US/Mexico border around 1:30-2:00 am, hitting the Thermal area a few hours later around 4:00 am, and finally moving up into the Palm Springs area around 6:00 am. The airmass change was accompanied by a brief wind shift to the southeast, and greatly increased humidity levels. The air is also quite hazy from both the lower level humidity, and the smoke that blew into the valley last night from nearby fires. This came in a day earlier than was anticipated. The good news is the humidity layer is quite shallow, so as the day heats up, the humidity will evaporate away as the day progresses. Dewpoints will fall back into the 60's and perhaps back down to the 50's later in the afternoon. However, we will be increasingly influenced by southeast weather patterns and increasing humidity as the week progresses. Hurricane activity off the Baja coast will also add to the uncertainty. Hope you all enjoyed the brief spell of no humidity while it lasted! The month of August is opening up with more relentless heat. It is summer, and hot weather is no stranger to the desert. However, this summer has been one for the record books. Storm clouds from earlier July when 1.11 inch of rain fell in Palm Springs. Average OVERALL temp for July, 2018: 97.4 degrees. Palm Springs experienced 14 days over 110 degrees in July, with 9 of those days over 115! There were 5 nights where the low temperature was 90 degrees or higher! The average high/low for Palm Springs in July is about 108/78. Sad to say, but most of us would dream for a comfortable 78 degrees some morning soon! Look at the toasty temps the past 5 days as well! For those hoping for some cooler weather, your hopes will be dashed the next few days. A massive high pressure system will be strengthening over our area through Tuesday. This will only tend to increase our heat by a few degrees the next few days. The only good news is that the humidity levels have dropped and dew points have retreated back into the 40s and 50s. This dry airmass should last until Tuesday or so. It's possible the nighttime lows may finally drop below 90 degrees as the lower humidity allows slightly better radiational cooling each night. We're really splitting hairs at this point though! As the high pressure system over the desert Southwest weekend just a tad, and moves to the north by Tuesday night and Wednesday, the upper level winds will switch back to the southeast and east. This will allow the transport of moisture back into our area. This will support daily thunderstorms across Arizona and Northwest Mexico, which will increase the likelihood of gulf surges and thunderstorm outflows to increase humidity once again. It is quite possible we will experience humid and hazy conditions and southeast winds by Wednesday morning, with dew points over 65-70 degrees again. Afternoons may dry slightly, with more humid conditions returning in the late night and morning hours through the end of the week. The intensity of the humidity will be dependent upon exactly where the storms to our southeast set up, which is impossible to predict at this point. Temperatures will likely cool a few degrees, as humid air is not as conducive for temps much above 115. Therefore, we may see high temps fall back into the 107-112 range for Wednesday, Thursday and Friday. Any organized storms could even drop those temps further - but this isn't highly likely. The best chance of afternoon and nighttime thunderstorms during this time period will be in the nearby mountains, as well as the Joshua Tree/Yucca area. Perhaps we will get lucky and score some rainfall. Too early to tell. HURRICANES OFF MEXICO NEXT WEEK? Long range forecasts are predicting a series of hurricanes to potentially develop off Mexico next week. At this time, they aren't expected to hit Southern California, and instead will curve out to sea off Baja. However, the circulation around the backside of these systems could only serve to strengthen the southeasterly wind flow, and potentially solidify the transport of humidity our way. It will be interesting to see if the computer weather models change their tune, as a shift more north could support dramatically cloudier or wetter weather for Southern California. Just to our west, the water temperatures off the coast of San Diego have risen to a record breaking 77-79 degrees last week! This is far above the normal 68-71 degrees more typical for this time of year. Anyone traveling to the coast has likely felt the muggier conditions that are a result of these abnormally high water temps. Take a look at the imagery via this National Weather Service tweet, from a few days ago! So, the screaming message this week is STAY COOL, and HYDRATE! Let's hope we get some moisture later this week! Enjoy the lack of humidity Monday and Tuesday while it lasts! ROUGH WEEK IN THE DESERT... MORE DUST LATER TONIGHT? It has been a rough summer week here in the Palm Springs area. Extreme heat, periods of humidity, and smoke from the nearby Cranston fire have all contributed to a cauldron of atmospheric conditions that have strained even the hardiest summertime resident. The sun was red several evenings ago as it filtered through the pyrocumulonibus cloud rising from the Cranston Fire. Lightning and thunder was reported underneath the smoke plume. Currently, the Cranston Fire appears to be advancing very slowly to the southeast of Idyllwild, currently moving away from the town. The northwest areas of Garner Valley have been most vulnerable the past 36 hours. Most other areas are burning much less ferocious than in days past. Temperatures were remarkably hot this past week. Palm Springs International Airport (PSP) had a long run of temps over 110. Often, heatwaves of this magnitude will last only a few days... but this one lasted nearly an entire week. An uptick in southeast monsoon flow is expected tonight and Sunday. This will bring about another surge in moisture tonight and tomorrow. Also, thunderstorms are blossoming over sections of Arizona, and could possibly produce a haboob as they track west from Phoenix and Tucson later this afternoon and this evening. There is a slight chance these storms will hold together as they progress west, and if they do so, there is the possibility of another dust storm across the Coachella Valley tonight. Currently, the large thunderstorm complex is growing to the southeast of Yuma, Arizona. It is moving northwest. A large outflow boundary is possible as the system moves toward the lower Colorado River Valley. If this occurs, a large haboob could form. Another area of storms is forming in the high country to the northeast of Phoenix, and will likely move into the Phoenix area after 6pm. These storms could congeal as they move to the southwest as well... and could be a secondary source of high winds for eastern California tonight after 8-9pm. Either way, even if a haboob fails to materialize tonight, it is possible the entire Coachella Valley will experience additional fresh winds from the east and southeast at some point this evening between 8pm and midnight or so... along with haze and higher humidity. Dewpoints will likely surge up to or above 70 degrees once again. Another sticky morning is in store for us tomorrow! Sunday will bring a much better chance of afternoon thunderstorms across the local mountains. Firefighters will clearly be monitoring weather conditions in case erratic outflow winds affect the Idyllwild area. Additionally, any outflows from strong Arizona storms tonight could bring a wind shift to the southeast in the mountains later tonight - this will need to be carefully monitored in the Idyllwild area, as winds have been mostly from the west the past several days up there. Erratic winds would not be a positive development. Humidity will likely be higher on Sunday though, which is great news. It is possible a few thunderstorms could occur across our desert areas as well, but the chance is very slight. Longer term forecasts are trending drier next week. At this point, a diminishing chance of afternoon and evening thunderstorms will likely support only very isolated storms at best. The monsoon moisture from the southeast is likely to remain east of the Colorado River most of next week, if models are correct. This is tantalizing close to our area though, so any change in the weather pattern, even by 150 miles, could keep afternoon thunderstorms in the forecast. 7-10 day computer models suggest a trough of low pressure moving off the California coast the following week of August 6th, and could open the door for disturbances from the south. Any hurricane formation off the Mexico coast could spread moisture into the Desert Southwest under such a pattern. Temperatures will also likely remain at average under such a weather regime. Let's see if the future models hold to this or not! In the meantime, there are some amazing heroes among us. The brave firefighters that helped protect Idyllwild have been in town (Many located at the V Hotel). Idyllwild will need our help once the town is ready to accept visitors and the electricity returns. Our cherished local mountain getaway and the local businesses that rely on tourism will need us! Let's hope the fire continues to be brought under control and this horrific week will be behind us soon. Stay hydrated out there folks! A wall of dust moved through the Coachella Valley early this morning before 2:30 and 3:30 am, reducing visibility to below 2 miles for several hours, before a very gradual improvement this afternoon. The haboob was caused by several large thunderstorm complexes that formed in Arizona late last night, and moved west toward California. 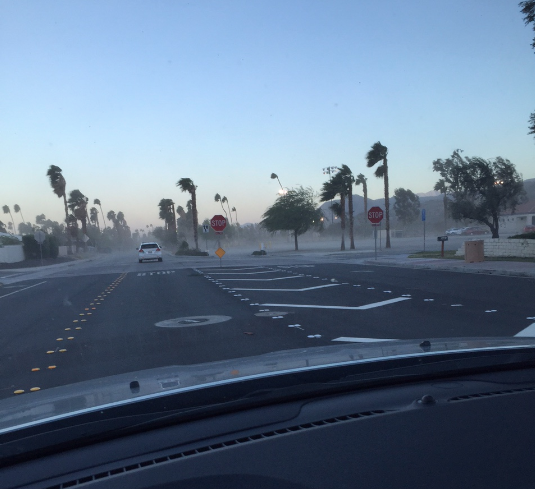 Most of the storms began weakening after moving across the Colorado River, but the high winds of 30-45 mph were enough to propel the dust storm northwest from Yuma and across the Imperial Valley, the Salton Sea, and finally, into the Coachella Valley. Here's a graphic displaying the progress late last night and early this morning. An even stronger batch of thunderstorms is moving west through Central Arizona tonight. It is unclear if they will hold together long enough for a repeat dust storm tonight, but current observations suggest we have a decent chance of a repeat performance. As of 645p, widespread dust storms are marching westward, west of Phoenix and Casa Grande, along I-10 and I-8. Winds tonight have been gusting 60-70 mph as storms moved through the Phoenix area. This is much stronger than last night's gusts, which started in the 50 mph range. Travel along I-10 and I-8 into Arizona will be dangerous this evening and should be postponed if possible, until conditions improve. Here's a current radar image. This is a very impressive line of storms. It's always difficult to predict thunderstorm development, but it is quite possible they could hold together enough to drift through our area tonight. Movement would suggest the potential of an earlier arrival than last night, most likely after 10-11 pm and into the early morning hours. More humidity, haze and high winds are possible, as well as reduced visibilities once again. Even if we are lucky enough to be spared another haboob tonight, Tuesday and Wednesday will see a renewed chance of thunderstorms, high winds, more dust storms and possible flash floods. This will keep temps down from their extreme levels felt a few days ago. Things appear to be trending drier Friday through the weekend, but that is of medium, not high probability. Take those outdoor umbrellas down the next few days in case we get more strong weather, and watch/listen to the National Weather Service for any severe weather warnings, if they are issued. SUMMER MONSOON PATTERN IS FINALLY HERE! EXTREME HEAT TO BE FOLLOWED BY MORE HUMID SUMMER MONSOON PATTERN! FINALLY! SOME WEATHER TO DISCUSS! Massive high pressure moving in from the east, accompanied by a sweep of extremely dry easterly winds swept through Southern California today, accompanied by temps approaching 120 not just in the deserts, but in the inland valleys of the rest of Southern California. Temperatures at 4:30p were still 110-118 degrees in many communities, including Palm Springs, Thermal, Riverside, Van Nuys, among many others. Today is historic and record breaking in that the heat was so prevalent and extreme in the areas west of the mountains as well. The high pressure came in on a bone dry airmass, with humidity down to 3% at times the past few days. HOWEVER - this is going to quickly change. As the more humid airmass begins to surge northwest the next few days, temps are likely to drop closer to 105-110 instead of 120. However, higher humidity will encourage continued discomfort. A gulf surge of humid air from the Gulf of California is possible Saturday morning, but is more likely Sunday or Monday morning. Such a scenario will bring in southeast gusts, hazy skies to reduce visibility, as well as dew points surging up to or exceeding 70 degrees. It's possible excessive humidity could even suppress temps to 100 degrees or less during the afternoons at some point the next several days. Today may be the last day in awhile in which swamp coolers will function correctly. With the increased humidity and instability in the atmosphere, will come an increasing chance of thunderstorms over the next 5 days. For today, the storms were having a late start in the normal "source regions" of northern and central Arizona, as well as NW Mexico. We will watch to see if any of these storms will move across Arizona into California later tonight. An extended period of easterly flow will leave our area vulnerable to thunderstorms. It will be impossible to pinpoint exactly where storms will pop, but we should be prepared for scattered thunderstorms capable of high winds, heavy rain, lightning, and even an infamous haboob (large dust storm). The highest chances of heavy weather appears in the Monday - Wednesday time frame. If additional clouds and storms are more prolific than currently planned, high temps could even struggle to rise above 100 degrees at some point the next 5 days. Here's a look at the computer models for next Tuesday, showing a continued deep flow of moist air from the east and southeast. The extended outlook for next week tends to look a bit drier towards the end of the week, but the pattern could still be sufficiently moist for afternoon and evening thunderstorms over the nearby mountains. Also of note, is ocean temperature trends in the Central Pacific are indicating rapidly increasing water temperatures suggesting the possible development of another El Nino pattern. Scientists will be carefully monitoring this over the next several months. If trends continue at the current rate, it would suggest a rather significant warming event that could create a strong El Nino, which raises the odds for an often significant by-product, above average rainfall for California. Too early to predict anything with certainty though! Keep an eye on the sky and on National Weather Service warnings, as we enter flash flood and dust storm season. It's about time there's some weather to write about! FIRST SIGNIFICANT STORM OF THE SEASON FOR SO CAL! "noun. A violent disturbance of the atmosphere with strong winds, and usually rain, thunder, lightning or snow." After the driest start ever on record for many portions of Southern California, a powerful winter storm will finally change our sensible weather of late, with the opportunity for damaging winds, a small/moderate amount of rainfall and much cooler temperatures for a few days. After a long hiatus, and nearly perfect weather the past few months, I've had little reason to post. This ridiculously extended period of benign weather will at least see a temporary reprieve. Palm Springs area residents should expect a rapid deterioration of sunny and warm weather conditions and a low-moderate potential for a high wind event. Wet droplets may fall from the sky again as well. WIND: Moderate to High Impact Possible. There is a low-moderate probability of damaging gusts as high as 50-75 mph in some areas Monday evening through Tuesday night. There is the possibility of some strong southerly gusts surfacing along the southern foothills Monday night, especially in the Andreas Hills, Araby, Cathedral City Cove, 111 corridor in Rancho Mirage, and South Palm Desert. The cold front should pass through Tuesday morning, with WNW gusts coming down along the 10 corridor from Whitewater to Indio by Tuesday afternoon. There is a low possibility of a downsloping event in more widespread areas of Central and South Palm Springs if the jet stream aligns from the WSW direction on Tuesday morning and afternoon. This is NOT a sure bet, but the potential exists. If downsloping were to occur, gusts over 50-75 mph could hit portions of Palm Springs normally sheltered by high winds. Therefore, Monday would be a GREAT TIME to tie up open pool umbrellas and other loose backyard furniture, just in case! Large areas of the high deserts and Joshua Tree will likely experience strong winds from Monday afternoon through Tuesday night as well! RAINFALL: Low to Moderate Impact. Rainfall amounts currently are expected to range from just a few sprinkles in some areas, to as much as 1 inch on the higher peaks of Joshua Tree National Park, and near the mountains. Most areas, however, will likely see only 0.10-0.50 of an inch - which will be enough to give a nice soaking, sans major flooding concerns. Isolated thunderstorms are possible Tuesday morning and could bring isolated higher rainfall amounts and localized flooding of roadways and washes if this were to occur. The potential for heavy rainfall is currently low to moderate. TEMPERATURES: High temperatures will drop for several days, but will recover back to near 80 degrees by the upcoming weekend, for those that enjoy sunny warm winter weather. As of Sunday night, the latest satellite pictures show two areas of low pressure off the West Coast. The upcoming storm system consists of two components currently. Area #1 is a subtropical area of low pressure that has been lingering far to the west of the southern tip of Baja for several days. This system is weakening, and will bring mild and mostly cloudy conditions for most of tonight and Monday, with a few sprinkles possible. Area #2 is the stronger portion of the system, which is currently strengthening and moving to the southeast. It will absorb weaker system #1 and will create a strong cold front that will move through Palm Springs sometime on Tuesday morning. A strong jet stream digging in around this system creates the potential for high winds in many areas of Southern California. Current computer models show strong jet stream winds circulating right into Southern California on Tuesday (below), centered around the low pressure that is expected to crash ashore north of Santa Barbara. Computer model projections show impressive rainfall (or rainfall equivalent for higher elevations where snow will fall). Large areas of the mountains of California are expected to receive 4-6 inches of rain, which may translate to 3-4 feet of snow at the highest elevations. Our local mountains will likely receive some white by Tuesday, as snow levels come down from 8,000 feet to near 5,500 feet. Expect 2-7 inches in Idyllwild on Tuesday, with more than a foot possible on the higher peaks near Big Bear. Areas west of the mountains such as the Inland Empire, San Diego, Orange County and Los Angeles could see 1-3 inches of rain, and lower mountain slopes could receive over 5 inches. Mudslides and debris flows could be a major problem for recent fire zones such as near Santa Barbara/Ventura, the San Fernando Valley and in Northern California. LONG RANGE HOPE FOR MORE STORMS? Currently, long term forecasts show another strong high pressure building back off the Pacific to the west of California after the next storm, with warm dry weather lasting about another week. The soonest another system could possibly tease California would likely be the middle of next week, but it's too soon to know if this will occur. Longer range forecasts show additional opportunities for systems later in January. One can hope! Enjoy the wild skies and windy days we will be treated to the next few days! Our relatively mild weather has come to an end, as we have quite possibly seen the last of the low 90 degree days for several months. The milder temps will be replaced by record breaking heat this weekend and next week, possibly of a long duration. Temps appear to peak Monday-Wednesday of next week. As you can see above, the temperatures will climb each day through Monday or Tuesday of next week, possibly reaching 120 degrees in Palm Springs next Tuesday. At this time, a rise in humidity does not appear likely. However, a shallow "gulf surge" from the Gulf of California is always a remote possibility if the wind flow turns southeasterly at some point over the next 7 days. This will need to be monitored. At this point though, low humidity is expected during this heat event, with dewpoints expected to remain under 50-55 degrees. A dewpoint under 55 degrees will allow evaporative coolers to continue to function, for those who utilize them. It appears the high pressure system responsible for the heat wave will be centered over the Phoenix area. This will allow temperatures there to possibly climb a bit higher than our area, possibly reaching 123 degrees early next week. If the high pressure system were to drift west over our area, this could allow our temps to climb higher than 120. These details are likely as the upcoming weekend approaches and the forecast becomes more reliable. If this high pressure were to drift a bit north, we could see our first summer monsoon flow. However, the deep southeast flow is not expected for the next 7 days. As we approach July, southeast upper level wind flow becomes more and more common, accompanied by afternoon and evening cloudiness, and isolated thunderstorm activity. This generally occurs in late June or early July. In the meantime, use common sense, and avoid strenuous outdoor activity during afternoon and early nighttime hours. There have been several fatalities due to heat already this season. The longest day of the year - known as the summer solstice - will be a memorable one yet again this year! Be safe out there, fellow desert dwellers! It looks like our sweltering desert heat of the past several days will soon end. A low pressure system is forming west of San Francisco tonight, and it will strengthen and move into Southern California Saturday and Sunday. This will bring cooler and windy weather back to the deserts the next several days, as well as scattered showers and thunderstorms throughout Southern California. It will be impossible to know exactly where the rain will fall, as the weather will be convective in nature. Showers will pop up in some areas, and may completely miss other areas. Satellite image as of Friday night shows a weak system off the coast. This system will move southeast and strengthen the next several days. By Saturday, the system will move slowly southeast toward Southern California. Strong west-southwest winds will likely buffet the mountains, high deserts and areas along the I-10 corridor. We will also have a strong chance of higher winds along the southern areas of the valley, as winds may have a southwesterly component. Strongest gusts are expected to reach 50 mph, although most areas will probably only see winds 20-30mph. High temps will likely only reach the mid 80's - a far cry from the 105 degree weather of late. Partly cloudy skies with scattered showers or thunderstorms are possible both days. Some areas may not see much of any rainfall, and others may see over 0.50 inch. There is even a very slight chance of a localized heavy thunderstorm with hail and strong winds. High temps will fall to 68-78 both days, and winds may back to the north. Snow levels may fall to 4,000 feet Sunday morning, but will likely rise to 5,500 feet by Monday. A few inches of snow are possible, but many areas will miss out. The storm will move out and skies will clear. Temps will likely approach 90 degrees of more, but are not expected to rise into the 100's. The weather pattern suggests additional low pressures may move south again during this time period. This should keep temperatures at or below normal, with another slight chance of showers possible. TOASTY THIS WEEK, THEN STORMS POSSIBLE SUNDAY-MONDAY? Date palm snapped in Cathedral City, not far from Golf Club Dr. The latest data shows incredible amounts of snow still on the ground in the states highest elevations, especially north of Southern California. The latest automated snow depth data at the Tioga Pass entrance gate to Yosemite National Park (Highway 120), at an elevation of 9,945 feet, shows a whopping 17.25 feet of snow still on the ground! This is a loss of about 4 inches in depth the past week or so. Mammoth Mountain appears set to remain open for skiing through July 4th, and some Tahoe area resorts are exploring the possibility of remaining open all summer and into next fall! Incredible snowpack up there! WET AND COOLER WEATHER TO RETURN NEXT WEEK? The rest of this week should remain mostly clear with hotter temperatures. Some afternoon and evening breeziness is possible as the week progresses, but high temps should remain in the 98-106 range through Friday, with lows in the U 60's - M 70's. This will definitely remind us of the summertime heat that awaits us all very soon! Starting around Saturday and continuing through around Tuesday or Wednesday, cooler weather is expected, along with periods of wind, and scattered showers or thunderstorms at times, as a system is expected to drop from the northwest. A low pressure is expected to become cutoff from the jet stream, becoming quasi-stationary and parking itself somewhere near Southern California. This is a very difficult weather pattern to predict, so it's best not to become too confident in the details this early on. However, it is fairly certain the weather will turn cooler. Depending upon where the storm system eventually settles in, it is possible that afternoon and evening showers and thunderstorms could develop over the nearby mountains for several days. Snow is a remote possibility on the highest mountain peaks. If thunderstorms are slow movers, this could create heavy rainfall for one specific location and drop little to no rainfall in other areas. We will have to watch the storm as it develops for further clues into its expected behavior. At this point, it appears low desert high temps will likely drop back into the mid 80's or low 90's on Sunday, and possibly down to the 70's on Sunday or Monday, before recovering mid week. Take away here is if you enjoy the heat, you will like the weather this week! But get out and enjoy it before the wind and cool return once again over the weekend! Not many weather forecasters are going out on a limb with this, but all signs are pointing toward another El Nino phenomenon building over the East Central Pacific this summer and fall. Water temperatures have been climbing upward in those regions and indications are that this may continue the next several months. After being burned by such wild predictions several years ago, the science community is being much more cautious and mum about the building sea temperature differentials at the moment. I've even been wondering if there are any studies that might connect our incredible winter deluges this year with the El Nino from the winter before. Keep an ear open for this bad boy over the upcoming summer, as it will undoubtedly bring forecasters more headaches as they attempt to predict what weather patterns will look like for the West Coast next winter. Another windy but dry weather system will move through the deserts on Thursday and Thursday night, with a 12-18 hour window of time where the potential for very strong winds will once again exist across the Coachella Valley, the nearby mountains, as well as the high deserts to our north. Wednesday afternoon satellite view (source: Meteostar). Another low pressure system is approaching the coast of Oregon, and will dive south into southern Nevada and Utah tomorrow. As the system comes shore in Oregon tonight, it will turn southeast and strengthen over the deserts of Southern Nevada and Utah. The surface low pressure is expected to deepen to around 994 mb by Thursday evening, which is expected to create howling winds from the southwest and west for Thursday afternoon and night. There is disagreement among the computer models as to the strength of the upcoming wind event. Thus, the National Weather Service has issued a High Wind Watch. As we get closer to tomorrow, the computer models will hopefully come into better agreement, and may upgrade the Watch to a High Wind Warning, which indicates strong winds are imminent. At this time, the potential exists for 40-60 mph+ gusts across portions of the Coachella Valley, the San Diego/Imperial County deserts to our south, as well as the Morongo Valley/Pioneertown/Lucerne Valley/Landers areas in the lee of the San Bernardino Mountains. 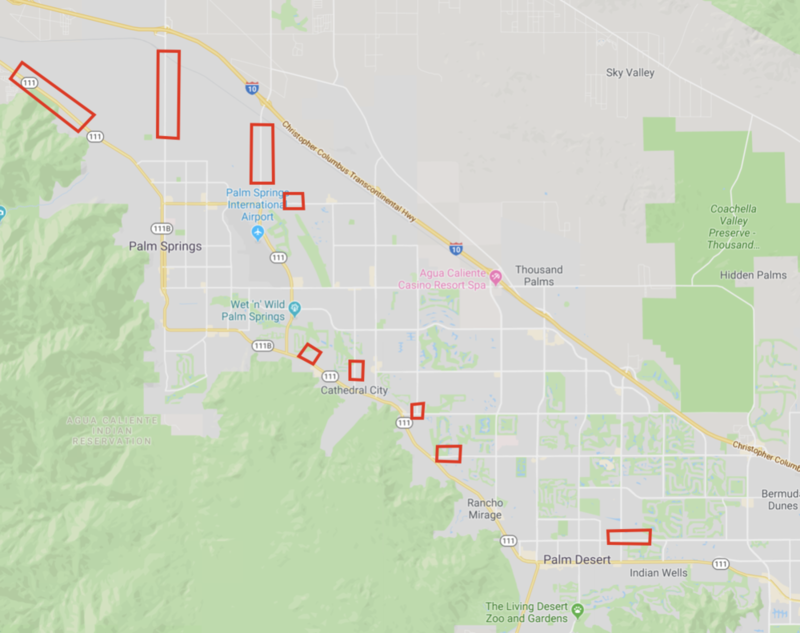 As we saw in Palm Springs several days ago, localized stronger gusts hit a small portion of Palm Springs from the Chino Canyon area, south into downtown. Gusts briefly appeared to reach or exceed 45-50 mph in a small area in West Palm Springs, with tree damage, power outages and brief blowing dust (see red area below). Other areas experienced gusts mostly under 35 mph, with much less damage. This was likely due to upper level winds being able to briefly descend down the backside of the San Jacinto Mountains around 4-6pm, due to "mountain wave" activity. Interaction with the higher terrain, inversion layers and upper level jet stream winds can sometimes occur in just the right combination to allow the higher elevation winds to slide down the back side of the mountains and briefly surface into the normally calmer areas of west or south Palm Springs. This upcoming event has the potential to hit localized areas once again, and likely miss others. Be prepared for the possibility of blowing sand, dust, broken tree limbs and blowing debris. There still is a chance the winds will not materialize - but now is the time to secure backyard furniture. Hopefully we will be spared the worst of it. Winds should shift to the north late Thursday night and Friday, and diminish to 35 mph or less. Winds should be mostly calm for Saturday and Sunday. Monday 88/58 - MORE WIND? Longer range forecasts suggest the possibility of a larger storm for the end of next week coming ashore in California. However, it's too early to hold high confidence in that forecast at this time. In the meantime, be prepared for another day or two of windy conditions before it calms down once again. This is a VERY NORMAL pattern for spring. Alternating periods of high winds, along with daily temperature fluctuations up and down as storm systems move by to our north. A weak spring storm is moving onshore over California today. Areas of scattered showers and thunderstorms are being experienced in many areas of the Southwest today, as well as gusty winds in portions of the mountains and deserts. Higher elevations have experienced some snow. For the Coachella Valley, as of 430p, currently a strengthening front is draped northeast to southwest across the valley, from near Las Vegas, curving south southwest across the deserts to near Indio, and southward to near Borrego Springs and south into Baja California. The front is currently stalling, and strengthening, with large thunderstorms forming just ahead of it, moving through Imperial County and eastern Riverside County. An impressive shield of cirrus anvil cloud tops are visible to the east, as a result of this rapidly developing line of thunderstorms. The line is temporarily stalled, but will begin moving slowly east towards the Western Arizona deserts the next several hours. Anyone traveling I-8 to Tuscon or I-10 to Phoenix tonight may experience strong winds and isolated heavy downpours or even hail. Here is a current radar image, showing the system to our east. Behind the cold front, an unstable airmass is producing scattered locally heavy showers and thunderstorms across the rest of California. The nearest storm cell, as of 430p, is a stray storm located in the mountains west of Palm Springs, between Banning and Hemet, moving slowly northeast and weakening. If this cell holds together, it is possible a brief shower or thunderstorm could affect the Palm Springs or Desert Hot Springs area around 5-6pm. Other cells have formed in the high deserts near Lancaster, as well as heavy rain and hail in the mountains of Ventura and Los Angeles counties. The Central Valley from Bakersfield to Fresno is experiencing large areas of heavy rain as well. Here is a radar image from Intellicast around 440p to our north and west. The rainfall to our north is expected to diminish after sunset, becoming much more scattered as the light of day diminishes the surface heating, which is fueling the pop up storms across much of the state today. Partly cloudy weather will return Thursday, with sunnier skies Friday. By Saturday, another weak system could bring very scattered showers, as well as another system around Monday or Tuesday. High temps will likely remain depressed into the 70's or low 80's for most of the next 4-5 days, with gusty winds at times. Enjoy the "cool down" while it lasts! Sign up with your email address to automatically receive weather updates. We respect your privacy. This list will not be shared with anyone else. Thank you for signing up for The Palm Springs Haboob! Look forward to sharing my thoughts/info on our local desert weather and beyond with you! Over 15 years of residential and commercial real estate experience in Southern California.